What a luxury to be able to travel for an entire month. This has never happened before in our working lives (and may never happen again, unless we remain expats). At first, we had quite exaggerated views of what we could accomplish in a month. “Let’s go to Singapore, Malaysia, Thailand, Laos, Cambodia, Vietnam, and maybe Hong Kong too!” we thought. Vietnam quickly came off the list because we needed to arrange visas in advance. (Without mail service, doing that from Congo would be quite the feat.) After a week or two of planning, I found that a trip to Laos and/or Cambodia would be difficult to squeeze in, and Hong Kong was too far away. We decided to focus on only the first three countries, and extend our stay in Thailand just slightly to take in more sights. So glad we did. As it was, the trip was rushed. We stayed between 2-4 nights everywhere we went, never got enough sleep, and quickly decided that 3 nights would be the “new minimum” on subsequent trips. Four is even better… as long as you like the place you’re at. Being a planner type, I made reservations for everything in advance. 9 flights, 3 trains, 5 subways, 5 ferries, and 1 limo linked all 9 hotels and 2 tours together. It took forever to plan, not least because every click on the internet here is precious. But it was effort well worth the pain and suffering, as we encountered not a single hiccup in logistics during the entire trip. 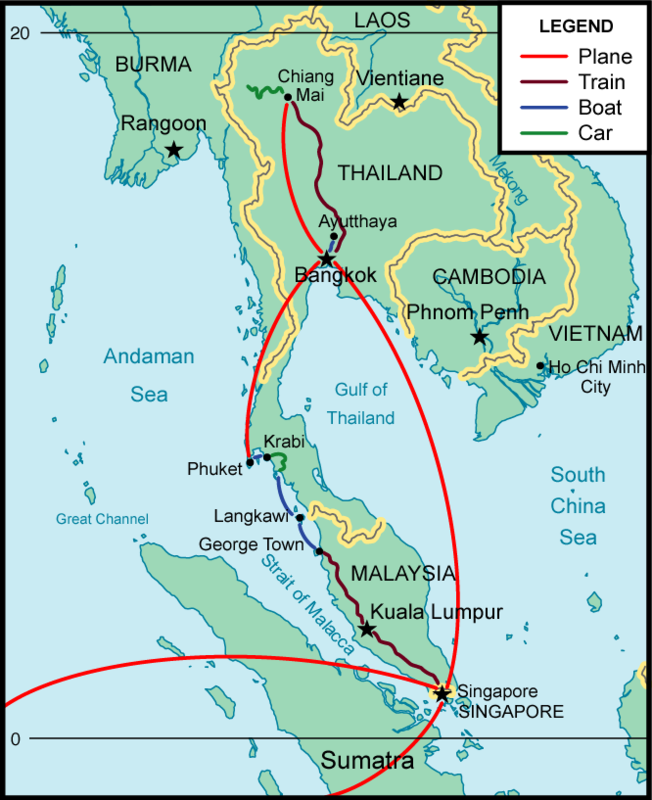 Our itinerary: 1 night in Johannesburg (out of necessity); an overnight flight then 2 nights in Singapore; a long train ride up to Kuala Lumpur then 2 nights there; another long train ride up to Butterworth, a quick ferry to the island of Penang, then 2 nights in Georgetown; a ferry to the island of Langkawi then 4 nights in the rain forest; a long ferry ride + bus + long-tail boat to a beach resort in Railay for 3 nights; a ferry across the bay to a seaside resort north of Phuket for another 3 nights; a short flight to Bangkok then 2 nights there; a 2-night cruise up the Ayutthaya river and back; an overnight train to Chiang Mai; a 2-night eco-tour in the northern hill tribes; 2 nights in Chiang Mai; and finally 5 back-to-back flights to get back home. Whew! I feel tired just remembering it. But I love traveling so much, and hate the thought of being so close to so many things I’ve never seen before… my instinct is to move, move, move, and take in as much as possible. I mean, who knows if we’ll ever be back in this neck of the woods? ?